The comic book cover draws the reader into the world in which the main character, Sarah Albany (known as Alba) is firmly entrenched. Pencil in her hand, her mind wanders between reality and the fiction she draws in her cartoon frames. As the book starts, Alba and her quirky bunch of friends have all just finished secondary school in a town called Eden Valley and face the decision, what next? But the story is not just about this interesting and transient time of young adulthood. It's also about the end of the world, where Eden Valley has been named as the only place to be spared. Alba lives with her mum in a bakery. Her father is dead and she has grown up with her friend Grady, a boy she is extraordinarily close to, but there is now one big problem between them. Grady is keen to become a lawyer and wants to go to the city to study. Alba doesn't want to make a decision to stay or go, quite happy if time could stand still. Then Ned Zebadiah ('prognosticator, seer and diviner of ancient mysteries') makes a prediction on the internet and it goes viral. Hippies stream into Eden Valley to escape the end of the world and the countdown begins. With the influx of outsiders comes Daniel, a former school mate of Alba's and now soapie star, who looks rather good with his shirt off. Written in first person, Alba's voice is strong, distinctive and funny. She gets off the track a bit sometimes, finds it a bit hard to focus on what is going on in front of her, but then cleverly gets back in time to move the story along. The camaraderie between the friends who have grown up together is well described and their reaction to the strangers that flock into their formerly sleepy town. Particularly skillful are the descriptions of Alba's drawing. 'I draw Cinnamon Girl close up and in profile here, her waves of hair billowing behind her and bleeding over the edges of the frames,' and 'I spend some time pencilling her solid legs, one foot in front of the other, resolutely marching through her unfilled frame.' Cinnamon Girl has a mind of her own, and is a good mirror for what Alba is going through in her life. Melissa Keil's first novel, Life in Outer Space recently was awarded the Ena Noel award and was shortlisted for several other awards including a CBCA book of the year. 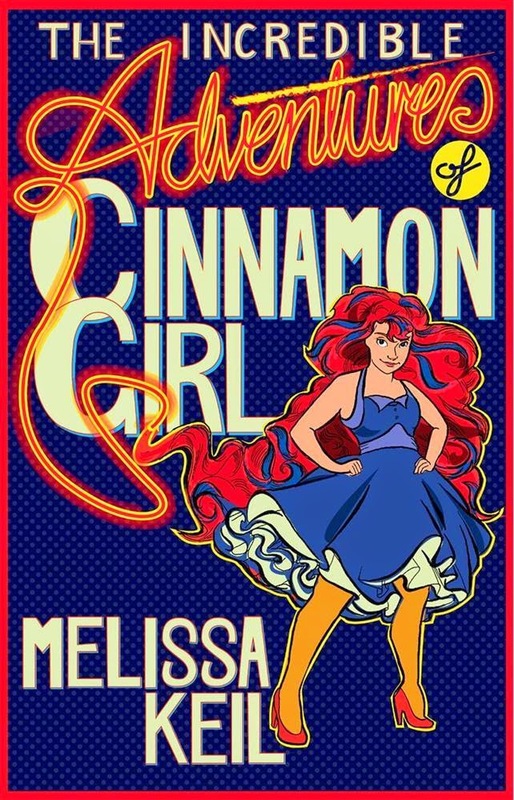 The Incredible Adventures of Cinnamon Girl is Melissa's second young adult book and she has produced another humorous, warm-hearted novel. The story flows well and has characters the reader can be fond of as they struggle with coming of age problems. A bit of a love triangle and a ride on a motor bike and there's a resolution that is both apt and satisfying.